It’s taken much longer to arrive than anyone expected, but the Voyce health and wellness monitor for dogs is finally about to ship. Voyce promises to reveal an unprecedented amount of data about your dog’s activity levels and vital signs, and just might emerge as a wearable that people (and dogs!) actually use. That would be great news for a wearables industry that’s still plagued by significant user attrition rates. Indeed, studies show an alarming number of people toss aside their activity trackers and smartwatches after just a few months of use. But, hey, if nothing else, fashion aesthetics shouldn’t be a concern with Voyce—unless your dog rocks herringbone like this. When I first covered Voyce 11 months ago at CES, its manufacturer, i4C Innovations, estimated a spring 2014 release. 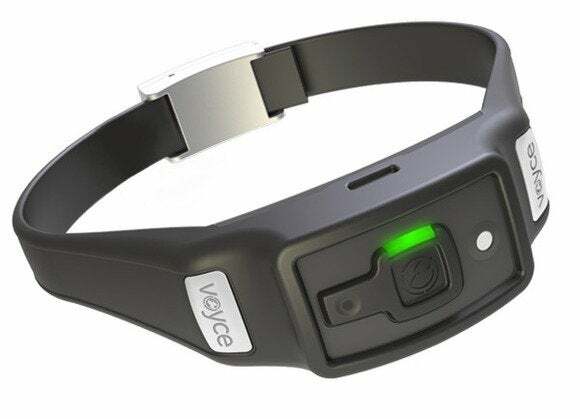 The hardware has been delayed for platform development and regulatory reasons, but on Tuesday the Voyce team announced that pre-order invitations are going out to people who’ve already expressed interest in the collar. A limited number of Voyce bands will ship in February 2015, with this initial supply going to those who order first. The band costs $300 along with a $10 monthly fee for Voyce’s ongoing subscription services. The Voyce collar comes in four different sizes, and boasts seven days of battery life before needing a recharge. It fits loosely around your dog’s neck, and doesn’t involve any prongs or probes. Between now and December 31, interested doggie parents can sign up to receive invites for the second round of deliveries, which is scheduled for March 2015. The full consumer release will then kick in shortly thereafter—and it can’t come soon enough. 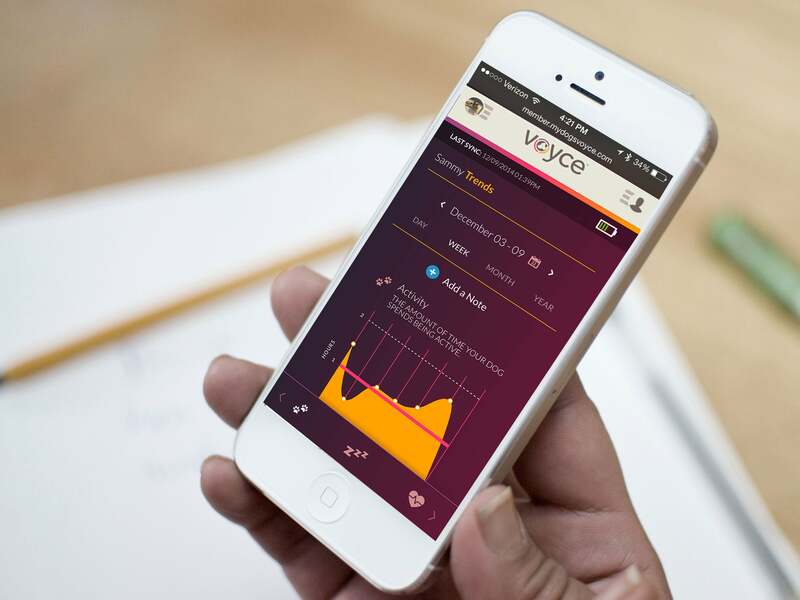 We gave Voyce our Best Wearable Tech award for CES 2014, and were alarmed when the band fell off the radar. There are already a number of canine wearables on the market, but Voyce will be the first to share heart rate and respiration levels, two data points that can reveal critical insights about the health of your dog. Why this matters: Some 70 to 80 million dogs are living in the United States as pets. In fact, between 37 and 47 percent of all households include a canine companion, the ASPCA estimates. That’s a huge population, but these family members can’t directly communicate when they’re feeling ill or suffering from slowly worsening chronic conditions. But thanks to a patented sensor that uses low-frequency radio signals to measure a dog’s heart and breathing rates, Voyce can tell you whether your pup is under unusual stress. In fact, Voyce can potentially provide insights that can’t even be recorded at the veterinary office. When your dog is being probed and prodded at the clinic, his heart and breathing rates are already spiking beyond their baseline levels. Voyce, however, records these key vital signs when your dog is calm and at rest—and this is the data that’s truly useful in identifying health problems. 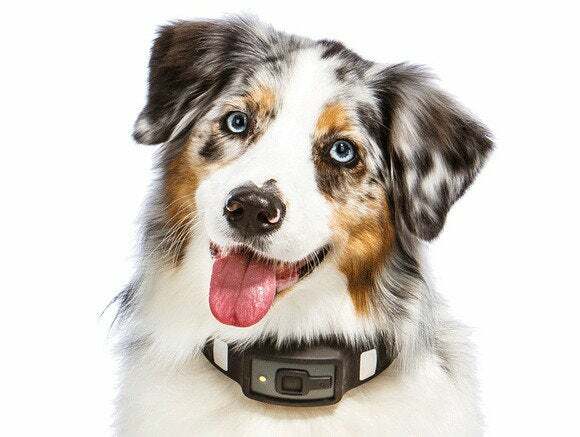 i4C Innovations says the Voyce collar’s accuracy is comparable to that of a Televet, a vest-style holter monitor that only veterinarians have access to. 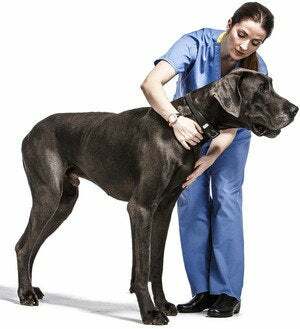 Voyce’s four collar sizes are large enough to support Great Danes and Bull Mastiffs, but currently toy breeds aren’t in the program. So why has it taken so long for Voyce to come to market? For starters, the company tells me that it wanted to add more features to its analytics platform. For example, since I last covered Voyce a year ago, i4C Innovations has added a symptom checker tool that helps identify common medical problems, as well as a new graph view that shows the intensity of your dog’s activity. But one of the biggest delays circles back to the FCC. 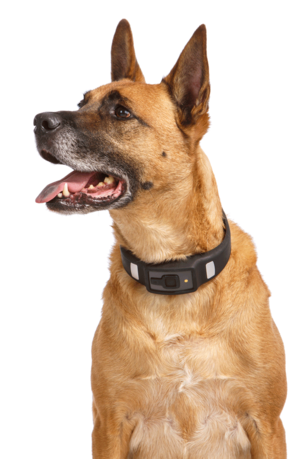 In addition to a common accelerometer that measures your dog’s movement (and thus her time spent active), the Voyce band includes a sensor that uses low-frequency radio waves to measure heart rate (tracking the carotid artery) and breathing rate (tracking muscle movement). i4C says it has exclusive patent rights to use this technology in products not intended for humans, but the FCC didn’t have any protocol for testing and certifying this particular application. Well, the FCC finally developed a methodology, completed certification this month, and here we are: Dogs can join the quantified-self movement just like any self-obsessed human. Heart rate and respiration data doesn’t sound particularly exciting on the surface, but when you’re trying to tease out insights on your dog’s physical and mental health, this information can speak volumes. Emily Hartman, i4C’s Director of Product Management, explained that unusually high heart rates can point to a dog who’s fallen sick, while high respiratory rates can be an indicator of heart disease. The main Voyce dashboard shows daily, average and weekly data views, plus your dog’s progress toward various wellness goals. Even Voyce’s relatively simple activity data can paint diagnostic pictures. When you leave your dog alone at home, does Voyce report a lot of activity right after you shut the door? This can point to separation anxiety. Or, conversely, is your dog extremely active after a long nap? This can point to general boredom when you’re away. Or what about your dog’s sleeping patterns? Did he used to sleep through the night, but now wakes frequently? This can indicate early onset arthritis. Or maybe he’s having hip issues and just can’t get comfortable. The Voyce band promises up to seven days of battery life, and syncs with i4C’s cloud platform over Wi-Fi every four hours, or on demand with a button push. There’s currently no mobile app, so push notifications are off the table, but the Voyce website is built with responsive design, and renders quite nicely on phones and tablets. In addition to many of the same data views you get with human activity trackers—time active, time inactive, miles traveled, calories burned—Voyce also reports hours in direct sunlight. And of course there’s the heart and breathing rate data. But the subscription platform also has tools to check medical symptoms, store medical records, set reminders for medication, jot down notes on your dog’s behavior, and share everything you collect with your veterinarian. Here we see a daily breakdown of activity by hours. Notice how you can add notes—useful for correlating real-world events to data. Beyond that, the Voyce subscription will direct you to peer-reviewed articles that are specifically tailored to your pet’s breed, age, diet, physical issues and mental state. Hartman told me that the entire platform and all the sourced articles were created with the help of vets, trainers, behavioral experts, and veterinary nutritionists, cardiologists, oncologists and toxicologists. Dog behaviorist Alexandra Horowitz, author of the best-selling Inside of a Dog, is the biggest-name contributor, but the company’s full list of experts is impressive from top to bottom. It seems i4C has done its homework to make sure that $10 monthly subscription fee is worth the price. Total cost of ownership comes down to about $420 for the first year, and $120 yearly after that. This may seem expensive to all the unfortunate people who don’t have dogs in their lives. But if you do have a dog—and particularly if you’ve paid for even the most trivial-sounding veterinary procedure—you know that $420 in preventive care is a pretty good deal. Are you interested in Voyce, and have questions? Please ask in the comments section of this article. Otherwise stay tuned for my full review, which I’ll post sometime in March. Whiskey is waiting for her chance to get in on the wearables action.